You Be You inspires readers to transform their lives by challenging their mind-set and focusing on self-love. You Be You is designed to empower you to seek more, be more, and do more–from a place of self-love, first and foremost. Loving yourself is not selfish; it’s necessary. In this book, transformation specialist Drew Canole shows that no matter where you’ve been or where you are right now, there are tools you can implement to live fully, healthily, and happily. Drew himself has overcome insane obstacles–from a painful childhood spent in foster care, to being bullied, to an unhealthy relationship with food that resulted in gaining 40 pounds, to finally breaking through and harnessing his personal power to achieve incredible success! 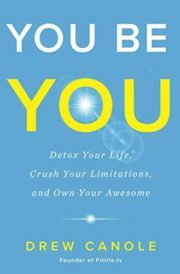 Drew will take you on a three-part journey to detox from external expectations, embrace your darkness and reclaim your light, and recognize your limitless potential. You’ll shift from your current perspective and limiting beliefs to a new, more enlightened mind-set that includes surrender, trust, self-honesty, meditation, positive intention, and kindness toward yourself and others. And the result? A life aligned with true purpose, meaning, and incredible amounts of awesomeness.